Can this be safely used with the Max3232 breakout (BOB-11189)? I couldn't find a max Vp-p rating in the datasheet or on this page. I am considering using the piezo pressure sensitive element on a motorcycle to determine when the rider is attempting to up shift, pull the shift lever up. I need to know the amount of pressure applied, to avoid false/positive shift attempts(e.g. accidentally touches shift lever). I also need to know when the shift has been completed (shift lever released by rider). Will the piezo element continue to return positive values while pressure is applied, when polled via GPIO, or does it return a single value the first time pressure is applied? With wires ALREADY soldered on? Now that is convenience! At least to those of us who are used to getting them without wires. The disk proper is usually more likely to just be neighborly to solder than friendly.. Does the knock have to be on the piezo element or just on the same surface? It has to make the piezo element vibrate. If firmly attached to a surface like a door knocking on the door will cause it to vibrate. If firmly attached to a piece of foam, well, probably not. So it depends on the surface and the method for mounting. If I rip off the speakers off a pair of cheap earbuds and replace them with two of these... do I get music playing in my skull? You'll get buzzing more than music. 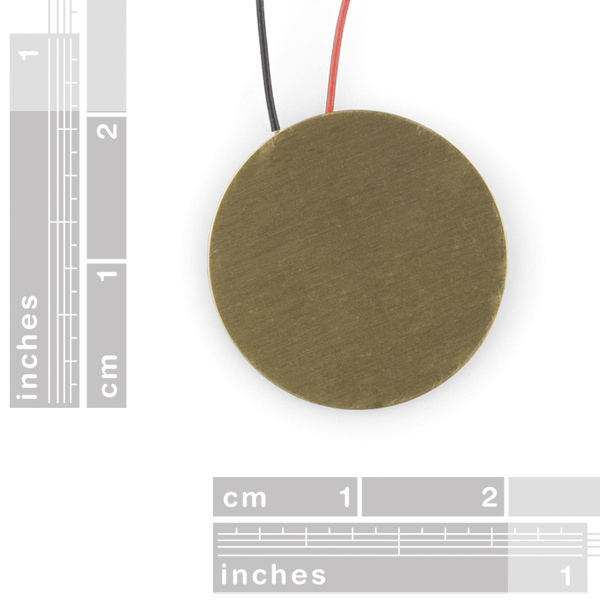 If you want to make 'inner-skull speakers', take a look at these small audio transducers. 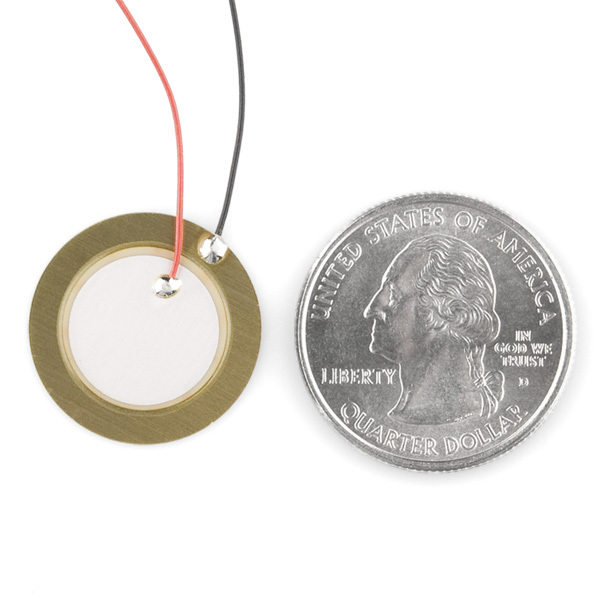 I'm looking to miniaturize my project that currently uses this buzzer for tones (https://www.sparkfun.com/products/7950). Is this capable of playing tones and would it be as loud? Is this the smallest option? I am looking to add tones to a small PCB to put inside a digital thermometer of sorts. Thanks! Would this be able to measure the level of a voice if placed near the neck or mouth? Another question I have is, would this be able to detect Tremors or "shakes" in some ones hand without picking up normal movements and vibrations (example of normal vibrations: putting a hand on the table or object)? Are you trying to measure SPL? What types of tremors/shakes are you trying to pick up? If I put a straight dc current through this will it buzz? Trying to find a cheap buzzer for the "squishy circuits" projects. 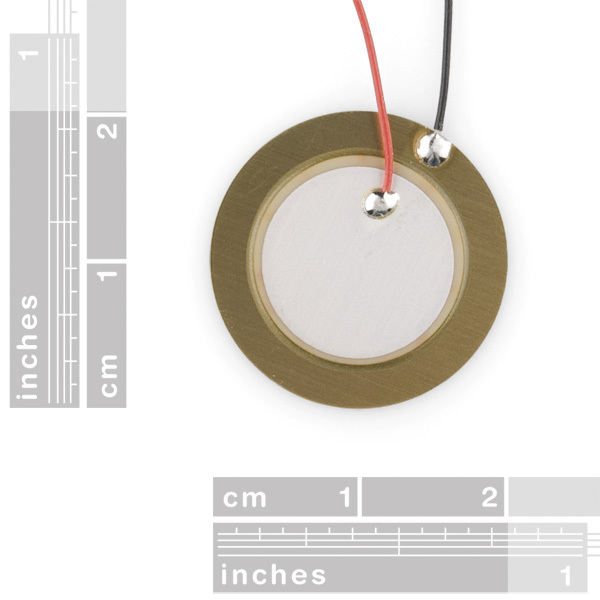 Does anyone have experience using the this piezo element as a throat microphone? i have seen projects where it has been used as a guitar pickup, but i haven't seen anyone use it to record voice. can this pickup the vibrations of my voice if it held against my throat? i trying to find a super simple microphone circuit that can record my voice in very windy conditions. yes. it works, and sounds really cool and somewhat muffled. you can make some really weird noises with it that you usually can't. Is this product identically to SHOCK SENSOR 801S? Would I be able to use this and a simple transistor circuit to detect taps using this piezo element and light up some LEDs based on vibration? I am planning a light up drum project and I need something to detect hits. These can be handy for detecting small signals when troubleshooting. They're not picky about voltages so you can use them places you can't use a logic probe; I've stuck them on RS485 serial lines for instance, one pin on signal, one on ground, for audio feedback when anything is happening. They have a (relatively) big capacitance though so would probably badly distort anything analog you attach them to. These work as awesome pickups for small scale guitar. Does anyone know if these things, held against the chest or a wrist, would be able to pick up your heartbeat? Maybe, but these definately will! http://www.sparkfun.com/products/9196 send me a link to your project if you ever get around to making it! I connected the red lead to the positive of my multimeter and the black lead to the ground. Shouldn't I be getting some voltage by knocking on it? All I get is a few millivolts (negative values too). I used it with a 2.2 KÎ© resistor. A digital multimeter isn't going to be fast enough to see it, especially since the signal goes positive, then goes back negative. A multimeter would average the brief pulse out to zero. Maybe try w/o the resistor? How similar are these to the elements in Nike+Ipod devices? Very very similar. I don't know the exact specs on the Nike iPod piezo, but they are functionally identical. Cool, I didn't know you guys had a tutorial on that. The need for strain relief is assumed. You will need to make sure the wires don't move excessively. Also, the wires can be soldered back easily. Be extra careful if you're soldering to the back of these. The inner wire is attached to a sputtered layer, which is solder soluble (in my experience). This means that excessive soldering reduces electrode area, and the sound output is reduced proportionally. If you're aware of this, and don't spend forever soldering it (I was using it for a ground plane on a tiny alarm clock), you should be fine. 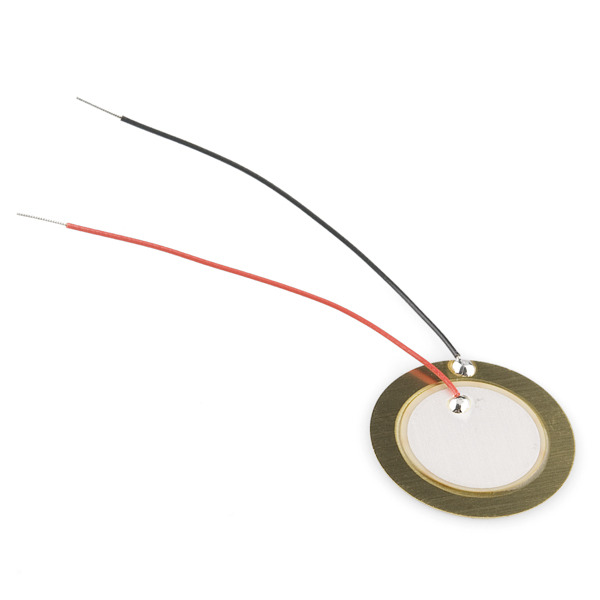 This piezo element needs some mass to make a loud noise or detect vibrations. After I did that, it has a nice high pitched frequency range. It can also detect footsteps throughout my entire house with the standard Arduino ADC and no amplification. How awesome is that? Nothing to add to the previous review - put some mass on (not a lot though) and it will detect slightest vibrations. Make sure it suits your application though.